As a composer, guitarist and researcher, Benjamin Dwyer’s creative and critical work extends from a broad base in performance and artistic practice. He is an elected member of Aosdána, the Irish government-sponsored academy of creative artists and is an Associate of the Royal Academy of Music, London (ARAM). Dwyer has given concerts worldwide, appearing as soloist with the RTÉ National Symphony Orchestra, the Irish Chamber Orchestra, the RTÉ Concert Orchestra, the Neubrandenburg Philharmonic Orchestra (Germany), the Santos Symphony Orchestra (Brazil), VOX21, the Vogler String Quartet (Germany), the Callino String Quartet (UK) and Barry Guy’s Blue Shroud Band. Dwyer’s compositions are regularly performed internationally. He has been the featured composer at the Musica Nova Festival (São Paulo), the Bienalle of Contemporary Music (Riberão Preto), Composers’ Choice (Dublin) and the RTÉ National Symphony Orchestra’s Horizons series. In recent years, he has completed a number of large-scale works including Twelve Études for guitar (Gamalan label) Concerto No. 2 for Guitar and Orchestra (written for the Brazilian guitarist Fabio Zanon), Scenes from Crow (Diatribe label) based on the Crow sequence by Ted Hughes, and Umbilical, his re-working of the Oedipus myth written especially for Maya Homburger, Barry Guy and David Adams. He has recently completed imagines obesae et aspectui ingratae… for violist Garth Knox and Strange Country, in collaboration with American-Irish poet Kimberly Campanello and uilleann piper Donnacha Dwyer. Benjamin Dwyer is Professor of Music at Middlesex University, London. Photograph: Brian Kavanagh. 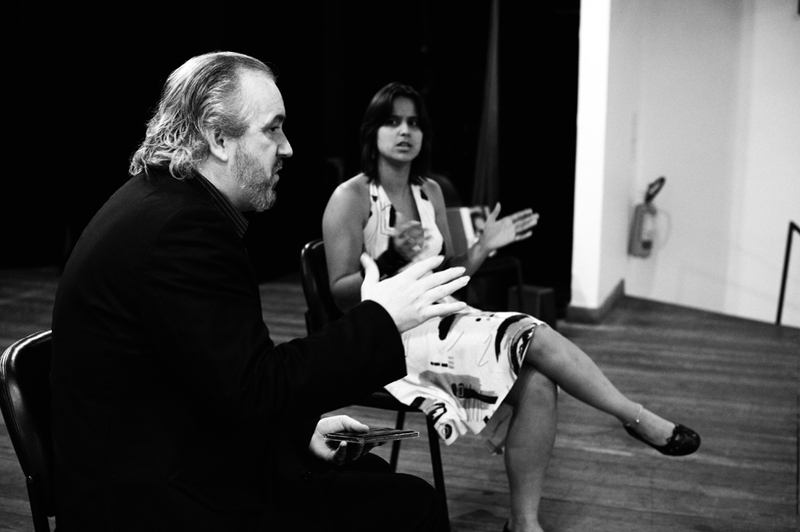 Benjamin Dwyer, lecturing at the Bienalle of Riberão Preto, Brazil, 18 October 2009. Benjamin Dwyer, ‘Transformational Ostinati in György Ligeti’s Sonatas for Solo Cello and Solo Viola’ in György Ligeti: Of Strange Sounds and Foreign Lands (Boydell & Brewer, 2011).